Mr. Chetcuti is a professor of workers’ compensation law having taught classes and seminars in behalf of the State Bar, CA Dept of Insurance, WorkCompCentral, Insurance Educational Association, various professional organizations and associations, and privately to attorneys, claims professionals and employers in California and other states. He is certified by the State of California, Bureau for Private Postsecondary and Vocational Education, as an instructor of Workers’ Compensation Law and Procedures. * His past experience includes being the director of education at Acacia Pacific in San Francisco. It is estimated that over his career Prof. Chetcuti has taught workers’ compensation law and procedure to over 19,000 students. He is also a former vice-president in charge of workers’ compensation claims consulting services for the two largest insurance brokers in the country. He is often retained as an expert witness in litigation concerning workers’ compensation insurance and TPA claims handling performance issues. 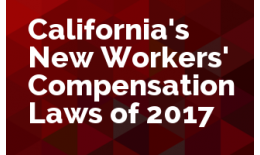 The IEA and Professor David Chetcuti proudly announce its annual three-hour seminar on the New Workers’ Compensation Laws of 2017 along with a few other topics. Ten NEW laws will be discussed.